If you have not personally experienced the evolution of VMware's product history, you might struggle to gain a perspective on their product portfolio. The virtualization specialist has expanded its product line considerably in recent years, especially in the area of data center/private cloud solutions. In this article, I look at a few of the VMware cloud tools and review some updates to VMware standard services and software. The company recently surprised everyone by announcing a hybrid cloud solution under the name "VMware vCloud Hybrid Service"  that targets established products from leading manufacturers (e.g., Amazon Web Services, Google Compute Engine, Rackspace, Microsoft Azure). The service is now available in the US as part of the Early Access Program, with a plan for it to go on general sale in 2013Q3; the rumored release date for Europe is 2013Q4. The special feature of VMware's Public Cloud Solution is seamless integration with existing solutions and management tools, meaning that vSphere administrators, for example, who already use vSphere servers can monitor, manage, and migrate VMs from the vSphere client using the freely available vCloud Connector plugin (Figure 1). The vCloud Hybrid Service, like all other VMware cloud concepts, is based on vSphere but benefits in a particular way from its advanced features, such as vMotion, high availability, and the vSphere Distributed Resource Scheduler. This property is called VMware "application neutrality." The vCloud Hybrid Service supports thousands of applications and more than 90 operating systems certified for vSphere. Companies can also securely extend Layer 2/Layer 3 networks existing in their own data center to vCloud Hybrid Services via VPN. For this, you need the same management tools and network and security models that VMware customers also now use for their on- and off-premises environments. At the center of the reorganized product portfolio, in the cloud data center virtualization range, is the new vCloud Suite , which VMware presented at last year's VMworld in San Francisco. 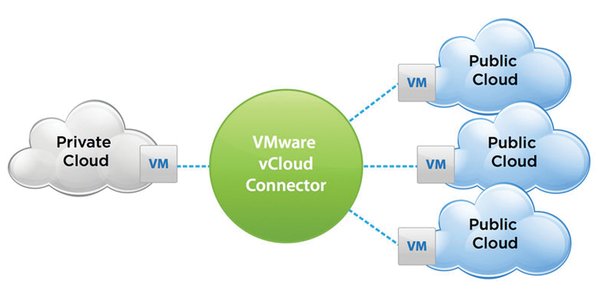 VMware gathers a number of new and old management tools together in the vCloud Suite. The range of tools is unsettling at first glance; such innovation is disconcerting, even for the leaders in virtualization markets. However, a close look reveals that many of the new tools are the result of acquisitions. In terms of management tools, one of the most important acquisitions has been Ionix products from parent company EMC in February 2010. No less important was the acquisition of SpringSource in autumn 2009, which gave VMware "Hyperic." Recent strategically important acquisitions include those of Integrien and TriCipher at the end of 2010, which incorporated VMware's product and technology portfolio and the self-learning analysis function AliveVM. California company Integrien develops real-time performance analysis software for applications and infrastructure that, in due time, was integrated into VMware's vCenter Manager.